The Jewish presence in former Spiš County was long limited to only one location - the village of Huncovce. Only after 1840, when Jews were permitted to settle in towns, did they form a community in Spišská Nová Ves. After Hungarian Jewry underwent a formal schism in 1869, this community was one of few that opted for the Status Quo Ante stream and remained unaffiliated with either the Orthodox or the Neolog movement. An elegant synagogue was built in 1899. In 1941 a German Hitlerjugend group on holiday set it on fire, aided by local people. It was later torn down. No Jews live here today, but the local secondary school (gymnázium) maintains the memory of the destroyed Jewish community. Its pupils have been actively involved in several educational programs researching the local Jewish past. As part of this, they contacted the last surviving Jews of Spišská Nová Ves, including those who live abroad. They also unveiled a memorial plaque to the children who attended their school and were killed in the Holocaust. The school also restored the local Jewish cemetery and took on the responsibility of maintaining it. A Torah scroll from Spišská Nová Ves survived the war and is today in use at the Northwood and Pinner Liberal Synagogue in London. 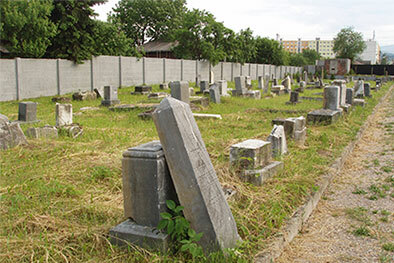 The Jewish cemetery is located on the eastern outskirts of town, near the railroad line. The oldest grave dates from 1880; the last burial took place in 1955. Toward the end of World War II, the German Army rebuilt the cemetery chapel into a pillbox fortification, which still exists today. The cemetery was not maintained after the War, and many tombstones were stolen or broken. In recent years, however, thanks to an initiative of the local secondary school under the guidance of a history teacher, Dr. Ružena Kormošová, the cemetery has been fenced and cleaned up, and the tombstones have been partially restored; an information plaque was installed, and the site is under permanent care. Thus, the last monument of the town’s Jewish past will be preserved for posterity. Hours: The cemetery is open upon request.